In the last water extrication post we talked about extrication tactics for vehicles partially submerged and what type of tactics and tools you would use for extricating a trapped paitent. Now lets look at you game plan if you had a fully submerged car with people trapped, what is your game plan? what tools, equipment, and training do you have for this? Do you have a dive team? If not what are you gonna do? There are many different answers to these questions and all of them depend on your level of experience and training. What about attempting to haul the car back to shore? When was the last time you did a good heavy rigging drill? How much will your winches hold? what type and grade chain do you have? What about using your SCBA as a SCUBA tank? 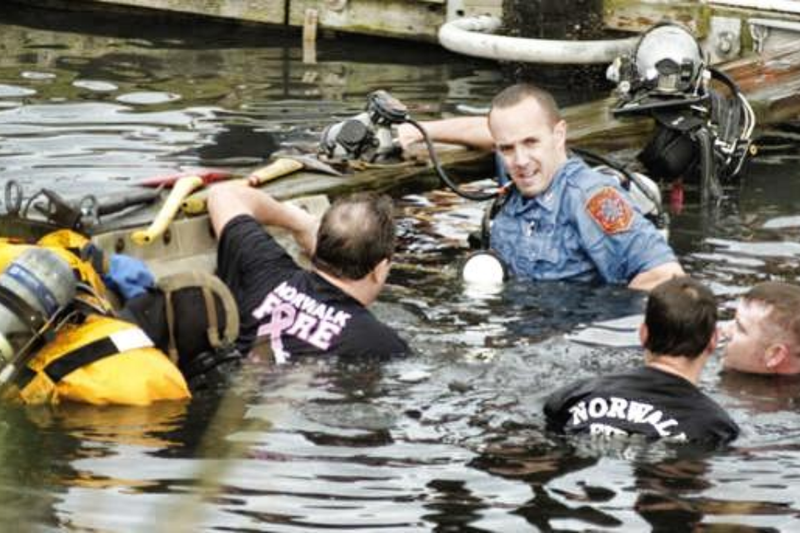 The picture below is of the Norwalk Ct. Fire Department using their SCBA’s to rescue two people from a submerged car. Both people were removed from the car, one was resuscitated the other was not. I know several other fire departments have used this method to successfully rescue people from submerged vehicles, so what do you guys think? Is this a valid rescue method? Is this something your department would do? Ever trained in this method? Let’s hear your thoughts! A new study states that experienced firefighters more analytical under stress than novices The study found that experienced firefighters had a better understanding of the consequences of a bad decision and therefore felt more stressed. What are your thoughts on Acting Officers and everybody just moving up when someone takes off? How important is Staffing? How important is it to comply with NFPA 1710 or going from an IRIT to RIT? The Above is from www.firefighterclosecalls.com go there to see more on Firefighter Safety and join The Secret List! !